Trio Harma was founded in 2014 at the Conservatoire National Supérieur de Musique et de Danse de Paris in order to share friendship, togetherness, and music. The trio is composed of Hector Burgan (violin), Jordan Costard (cello) and Mathilde Nguyen (piano). They study with Raphaël Pidoux, Jean -Frédéric Neuburger, and Philippe Graffin, respectively. 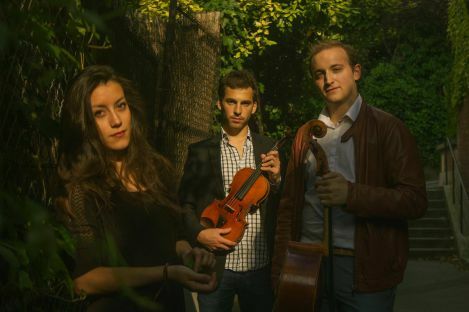 The trio attends the chamber music courses of François Salque at the Paris Conservatory and also receives special coaching from Trio Wanderer, Quatuor Ebène, and Quatuor Ysaÿe. Competition of FNAPEC. Then came the unanimous awarding of the 1st prize by the jury of the Antonio Bertolini International Competition in Cremona, as well as a 3rd prize at the Coop Music Awards in Milan. Trio Harma has performed at the Cite Internationale in Paris, at the Musique à Flaine and Les vacances de Monsieur Haydn music festivals, as well as at Milan’s Teatro dal Verme and at the Église Saint-Merri in Paris.